It was a while ago I blogged something about Doing Something Solar… I’ve not done a *whole* lot since then, but am planning on some research over the (sunny) summer on what it might take to rig some solar panels into my home grid. The folks at Connect2Earth were nice enough for doing something nice for me- for mentioning of their project, they sent me this cool gift. 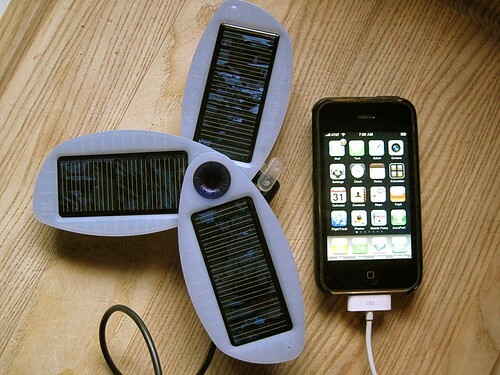 It is a Solio Hybrid Charger which has panels that can use the sun to fill its battery and in turn, re-charge any device powered by USB type connectors, including the iPhone. I’ve charged the battery up since I got home and will be testing the power of the phone charge (I don’t know if it is me, but my phone seems to charge more fully off of the A/C than my laptop). I can see some future use as a backpack tool just so I can fully geek out (or call for help) out in the woods. But even at home, if I keep this charged by the sun, and use it to power the phone and my mp3 player, well, it might just be a tiny tiny less amount of electric sucked from the coal burning on the grid. At least it seems to work better than my little hand crank/solar charger I keep in the car. So it’s a small solar start. I am super impressed with the personal treatment from the Connect2Earth folks- along with the nice gift was a personal letter, even if it was a mail merge, it sure felt genuine (thanks Vicky). Amazing what a bit of personal attention can get you these days. Should not be a surprise, but it sure feels rare. Thanks to you Alan ;-)!! !